Kukje Gallery is pleased to present a solo exhibition of Kim Yong-Ik as our final show of 2016. This marks the first time the widely acknowledged artist’s work is shown at Kukje and will consist of thirty new paintings made between 2015 and 2016. Kim’s artistic practice from the past four decades had been deeply impacted by the rapidly changing cultural milieu of postwar Korea. Over the course of four decades, Kim has devoted himself to what he refers to as the mark of “imperfection,” exploring this complex idea in both his own artwork and his critiques of the role of art institutions. One of the defining aspects of this inquiry and Kim’s oeuvre is his consistently independent stance amidst Korea’s dominant artistic movements, from the Modernism of the 1970s and conceptual art, Minjung art, to the rise of public art in the 1980s and 90s. The series of new paintings on view can be interpreted as a reflection of this ongoing conceptual evolution and a seminal chapter in the artist’s life-long artistic practice. Each work presented in the show has one of the following five titles: Apocalypse of Modernism, “In the Lingering Shadow” of Lies, Thinner…and Thinner…, After 20 Years, and Utopia. 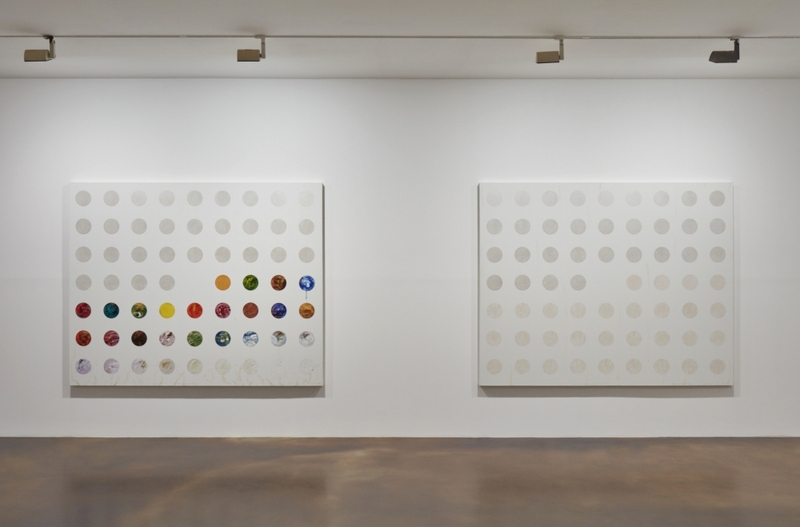 Present throughout all the series are Kim’s signature polka dots, first adopted by the artist in the early 1990s in an effort to create a mark on the authoritarian, immaculate surface of Korean modernist paintings. Kim chose the dot because it is easy to draw and symbolizes perfection. In the recent paintings, this early meaning has been set aside, and the dots reflect a simpler meaning yielding a pleasing array of tones and a rhythmic cadence. If Kim’s work thus far has dealt with his concern with the “modernist subject” often accompanied by rigid self-censorship and questions confronting the ethics of art or “art that makes sense,” the new paintings spared this burden of self-questioning to convey lightness that is readily visible in the thin surface of acrylic paint and light color palette. Kim Yong-Ik’s cynical undertone persists on the other side of this “lightness.” A majority of his new works are the result of his reinterpretation and reappropriation of past works that had remained as sketches or prints. By reworking these previous ideas, the artist maintains his stance that “art today can no longer be politically or ethically correct and that artistic production inevitably results from editing rather than creating.” Despite this strident belief, Kim continues to insert his trademark humor into the works in the series, using organic elements such as plant extract coupled with tiny scribbles left on the surface to destabilize any singular interpretation or mechanistic repetition of symbolic value. This paradoxical pairing further elucidates the fact that these works, rather than an ode to lightness, are engaged in a dialogue of existential proportions, grappling with the contradictory conditions that art is facing today. Kim Yong-Ik (b. 1947) first unveiled his Plane Object series in 1974 while under the tutelage of Park Seo-Bo at Hongik University’s Department of Painting. In 1981, just as he began to establish his name with this series, Kim made a bold decision to “bury” his work in a cardboard box and present it as is. During the 80s and 90s, while the domestic art scene was strictly separated into Minjung art and Modernism, Kim sought to retain a middle ground by actively engaging in environmental and public art projects all the while producing important writing that developed his artistic philosophy. From 1999 to 2012, Kim was a professor in the Painting Department of Gachon University (former Kyungwon University)’s College of Art and Design. He also served as a founding member of Art Space Pool, an alternative space established in 1999, and then as its director from 2004 to 2006. Kim was the subject of a comprehensive retrospective that examined his 40 year-long practice at Ilmin Museum of Art earlier this year.